The Lego Store in Hanoi picture taken by josemarques on 19 Aug 2010. 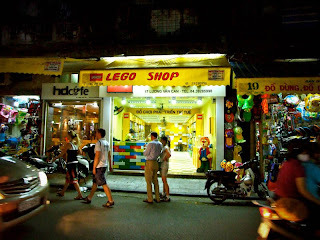 A Lego store in Hanoi? Not sure if this is the official lego store. 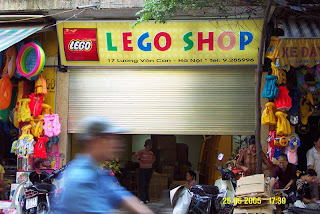 Was planning to buy lego from Vietnam Ho Chi Minh City with my existing contacts. Having been to Hanoi in 2006 and HCM 2007, Vietnam is a massive trading hub, importing goods mainly from China (lego after all was mass produced from China factory), there are certain products which can be really cheap, because of their close promixity with China. Searching for information on Vietnam lego, this is the first picture i came across. A Lego Store in Hanoi, this picture was taken in 2005 by ebifry who had shared on his flickr photostream. With boxes of lego stacked up inside the shop, it looks like the store was opening soon. The stores in Hanoi are real and official, if they have the sign LEGO on them. And i believe they must have been shipped in from Europe in order to get that kind of price. If you're looking for rip off Lego from China, find them in small toy shops that also sell electric toys and stuff like that. The ones in HCM are official lego, they are avaliable in big retail stores.. for those in Hanoi, it is hard to tell.. it is way up north and it's difficult to determine if they are cheap clones from China.